Don’t build your business on something that you don’t own. That’s my golden rule for artists, makers, and small businesses who are serious about building something for the long term. It’s why I don’t think you should build your website on a hosted platform, and it’s why you need an email list. It’s your ace in the hole the next time Facebook, Instagram, Twitter, Pinterest, or whoever change their advertising policies or feed ranking and send your carefully-built audience to the bottom of the ocean. Anybody can build an email list, and everyone can benefit from one. Remember that time when your favorite social network decided to “improve” their feed ranking algorithm and all of a sudden you went from 1000 likes a day to 10? Or when Etsy changed the way they sort search results and your product ended up on page 983? And there was nothing you could do except start working harder and posting twice as much. Actually, there was something else you could do: build an audience that you control and that nobody else is going to mess with. Let me put it this way: how would you like a way to establish an audience of people interested in your products or services that you can talk to directly about what you do and how you can help them with what you make or do? How would you like a way to be able to ask your customers exactly what they’d like to see you work on next? How would you like an audience of hundreds, or thousands, of people to announce your next product to? That’s why you need an email list. An email list is a group of people who have raised their hand and said “hey, what you write is pretty interesting, and I like what you make, too!”. You’re not spending all your time creating content for social media or dumping money into ads on a social network, hoping the right people see them. And here’s the best part: as long as you keep providing valuable, interesting content to your email list, nobody can take that audience away from you. Not Twitter, not Etsy, not Pinterest, not Instagram, or anybody else. It’s just you and your subscribers. When you say “email list” people usually think of signup forms on websites like this one (yup, sure enough, there’s one at the bottom of this page). And people think that getting a decent website is a big, difficult project. So they skip building a list, and keep building their business on other peoples’ platforms. But you don’t need a website to start building your list. All you need at the beginning is a way to start collecting email addresses. Here’s another place where a lot of people get stuck. They’re afraid of being slapped with the “Spammer” label, or don’t like asking people for things like their email addresses. Fortunately if you take one simple precaution you’ll be sure to never spam anyone. And if you don’t like asking people for things…like asking them to buy your product or service…well, I’ll just say you ought to look into that sooner rather than later. You don’t need a website to start building your list. You don’t need an emailing service like MailChip or Emma (yet). You don’t even need to have your first newsletter written. All you need to do is to start asking people to join. That’s how you avoid falling into the Spammer trap: make sure that everyone on your list has said, affirmatively, “YES! I want to start getting your emails.” And if for some reason they decide they want to stop getting your emails, make it easy for them to get off the list. Where do you find people to ask? Start with the audiences you already have. Your social media followers and friends are a great start. Tell them about the list you’re starting, what you’re going to be writing about, and how to join (send you their email address). Don’t forget your customers, either. Unfortunately, you can’t just take the email addresses of everyone who has ever done business with you and start emailing them. That’s spamming, too. But, you can start telling your new customers about your list. Put a short sentence at the end of every email or Etsy Convo message that you send, pointing out that you have a list and what the benefit of joining is (insightful articles, early access to new products, special deals, whatever provides value to your customer). You’ve got Emails, Now What? Once you’ve gathered a healthy amount of opt-ins (100 emails is a good start) it’s time to take the next step: setting up your email list system and writing your content. 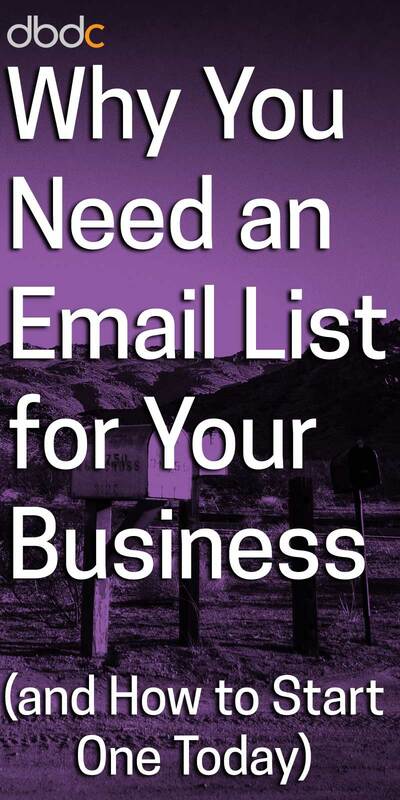 You’ll need to sign up for a service to manage your lists and send your mass emails out. Personally I use MailChimp, and they’re a great place to start since they offer a free plan for lists up to 2000 email addresses. But other services like Emma, ConvertKit, and Aweber all provide similar services. What a service like MailChimp does is take care of the back-end work for you. They make sure that your emails don’t end up in Junk folders, and that your emails look great on everyone’s screen. They also let you create professional-looking subscription forms that you can add to a website or link to directly, and they manage unsubscribe requests and purging bad email addresses from your list automatically. OK, you’ve got a list of people who have told you they want to get emails from you. That’s fantastic! Now all you need to do is start writing those emails! You’ve got two problems: what to write about, and how to get it done. They seem like big problems, but don’t be scared of them. You like writing about it. If you pick a topic that doesn’t interest you at all, your motivation will be non-existent and the quality of your writing will suffer. Your audience will find it valuable. The quickest way to lose subscribers is to pump out nothing but hard-sell emails. People don’t join lists to be sold to, they join lists because they get something out of it. How-tos, thought pieces, access to pre-release products, whatever. Respect your audience by making sure that what you write helps them in some way. It fits with your business’s goals. Say you sell handmade shoes and you just started an email list. Your first email is about buying your new car. Sure, you love your car and like writing about it, and you’ve done a good job about filling your email with useful tips on getting the best deal. But what does it have to do with shoes? Will it make your subscribers more likely to buy your shoes or tell their friends about them? There’s nothing wrong with putting some personality into your writing, but remember why you have your email list and keep your writing focused on that goal. But how do you write a new article once a week, or once a month? If there’s such a thing as an email list guru, Bryan Harris is it. And he has brilliantly simple strategy: commit to writing 250 words a day for four days a week. And on the 5th day, take those 1000 words, edit them into your article, and hit the “Send” button in your mass email provider. The brilliance of Bryan’s technique is that it takes advantage of the fact that writing is a combination of desire, talent, and habit. The more you do it, the better you get, and the easier it becomes. Building your own email list insulates you against the unpredictability of social media marketing and gets you closer to your customers. You can do it whether or not you have a website, a social media following, an Etsy store, or anything else. To paraphrase the saying about planting a tree: When is the best time to start an email list? Last year. When is the second best time to start an email list? Right now. Go to it! Links to MailChimp are affiliate links.